With little man in the house, I have been having a problem lately with or dogs. Our border collie shakes his head a lot and his collar makes the perfect noise for waking up little man. It has been driving me crazy. What’s worse is that since little man is teething, he had been waking up more and is easier to upset right now. So, I must silence those dog tags for everyone’s sanity. I take the collar off my border collie at night. While this kept him quiet at night, it does nothing for daytime collar shaking and I need to remember to put it back on before he goes out in the morning. Also I did worry that in an emergency his collar would be off and he could get lost. I wrapped plastic wrap around the tags. This worked well for the border collie. Unfortunately, on my golden retriever, it didn’t even last twelve hours. I put it on at night and an hour after he got up for the day, he was working on getting it off. I can’t have the dogs eating plastic. Everyone should own a hot glue gun! I took my handy dandy glue gun and laid a bead of hot glue around the perimeter of the dog tag. Success! Here’s a picture of my work. I did this on every metal tag on the dog’s collar. Now, they don’t make a loud high pitched jingle / rattle noise to wake up little man. Gotta love solutions on a budget. The best part, as we get new tags (rabies renewal, moving…) or if it gets worn off, we can easily repeat the process. I’m glad that little man isn’t raised by the dog. I’m glad that he’s raised by Dad and I. Because we raise him and not the dog, he will grow into a strong, well rounded man that can cut his own nails, feed himself, go to the bathroom on his own and clean it too! He won’t fart in public and he will say “I love you” and he’ll at least be able to put on his own clothes. He’ll grow up and move out where he can have a dog of his own and teach the dog to do the things that dogs do. Most of the time when I write, it’s about daily life. What is little man doing? What is Dad doing? What am I doing? And what am I cooking? But sometimes it’s nice to stray from the usual and write about other stuff. Not what’s going on around me, but something completely different. I read a post titled “What If Your Husband Was A Real Zombie (Part Two of The Land That Ideas Come From)“. In this post, it talked about ideas that come from the “What if…” questions. After reading it, I looked over at my dog, between feeding bites of black beans to little man, and thought “What if my dog were raising little man?” and I think it would be pretty funny. But it just might work. Though the bit about feeding little man black beans, that’s going to bite me in the but. This is one of my favorite Christmas decorations. While we won’t spend the holidays with our parents and extended family, I’ve thankfully never had to spend a holiday alone. Birthday yes, but no holidays. 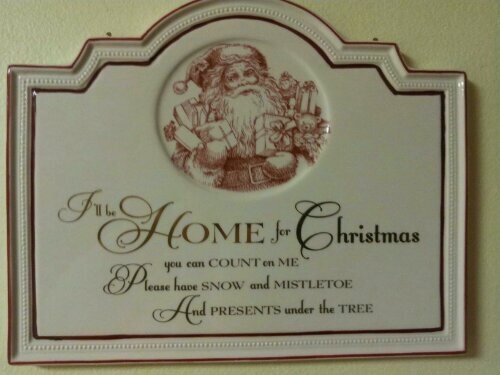 My wish for everyone is to be home for Christmas. Each year so many people are away from home for the holidays. One of my childhood friends was deployed last Christmas. While the family was sad he wasn’t home, I don’t think any of us could imagine how sad he was. This year, my grandma and my husband’s grandpa will both be spending Christmas in the hospital. She is in her late 80’s and he is in his early 90’s. I don’t know how many Christmases they each have left. This is my son’s first Christmas and I hope that he will always be home for Christmas. Maybe one day we will live close enough to the rest of our family to celebrate each holiday with them. We are already lucky that my parents and my husbands parents, and most of the extended family, live fairly close together. This makes visiting very easy. But due to the cost of airline tickets, dog boarding, as well as getting time off; I haven’t spent a Christmas with my parents in 6 years! Time sure has flow by and I get sad thinking about not seeing them but I only have to look over to my son to smile again. He is my family, and my husband too of course, and we will spend this Christmas together. Our first as a now larger family and I love it! We won’t have snow for Christmas, we haven’t had one since we left Utah (snow all winter long). We also won’t have mistletoe. I’ve actually never had mistletoe before. As far as the presents go, they are all under the tree waiting for Christmas morning. Except for 4 presents that is. One my sister got for my son is waiting all assembled and I’ll bring it down Christmas morning. One my mom got for my son has the instructions on it to open Christmas Eve. I’m really curious as to what that on is. The other two are in transit and I’m hoping they get here by Christmas Eve so we can have them Christmas morning. Otherwise, we will have to wait until the day after Christmas (or later) to get them.